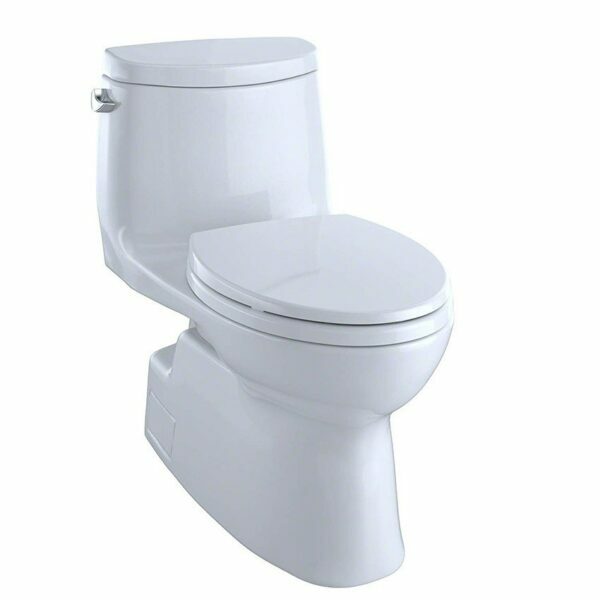 The TOTO Carlyle II One-Piece Elongated 1.28 GPF Universal Height Skirted Toilet with CEFIONTECT projects TOTO’s mark of excellence: “People Planet Water.” The TOTO Carlyle II features a sleek, one-piece design that will immediately upgrade the appearance of your bathroom. The one-piece design is not only aesthetically pleasing but also offers the benefit of being easier to clean versus a two-piece toilet. By removing the gap between the tank and bowl, we eliminate the hiding place for dirt and debris. An additional benefit of the one-piece toilet is that there is no threat of leaks from bolts or gaskets that can occur in two-piece toilets. The Skirted Design of the TOTO Carlyle II conceals the tramway, which enhances the elegant look of the toilet and adds an additional level of sophistication. Skirted Design toilets also eliminate the need to reach behind the bowl to clean the nooks and crannies of the exterior trap way. The TOTO Carlyle II features TOTO’s Tornado Flush, a hole-free rim design with dual-nozzles that creates a centrifugal washing action that assists in rinsing the bowl more efficiently. This version of the TOTO Carlyle II includes CEFIONTECT, a layer of exceptionally smooth glaze that prevents particles from adhering to the ceramic. This feature, coupled with Tornado Flush, assists to reduce the frequency of toilet cleanings, minimizing the use of water, harsh chemicals, and time required for cleaning. The TOTO Carlyle II is designed in TOTO’s Universal Height, which allows for a more comfortable seat position across a wide range of users. The Carlyle II is ADA compliant and meets the standards for EPA WaterSense, and California’s CEC and CALGreen requirements. The TOTO Carlyle II has a left-hand chrome trip lever and includes a TOTO SoftClose seat.